With over 50+ assessments and migrations we are one of the pioneers in Azure Services. We provide monthly managed services on your Azure investments for affordable monthly and hourly costs. Azure IaaS, PaaS and SaaS solutions have been embraced by Enterprises and SME’s alike. 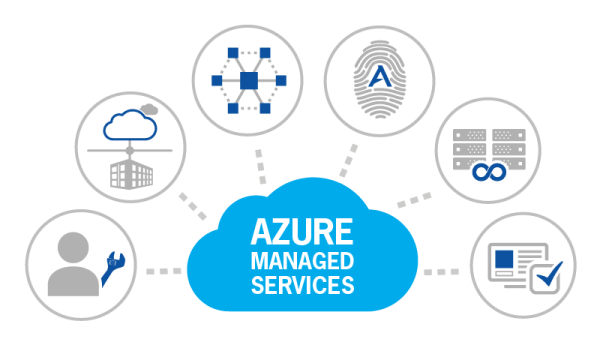 Benefits of cost optimization of azure by managed maintenance of Data Centers, Increased encryption and data security along with robust 99.9% SLA’s have carved out a large market segment in the industry. Most enterprises world over, have built their business lineage on older applications and systems which is becoming a spot of bother as it’s not able to address the business requirements of today. Here it wasn’t late response or waking up after the fact, just that disruptive technologies and forces like Big Data, Cloud, and Mobility didn’t exist back in the days. Today, scenarios have changed and companies are adopting, adapting and becoming adept at meeting changing business needs and this saw the migration to Cloud. This movement has drawn businesses and enterprises to Microsoft Azure as they see benefits and become increasingly responsive and agile and thus the turn to Microsoft Azure. Over time,Microsoft Azure has become indispensible for any business operation and it has become a key component to devising any IT strategy. It is Microsoft Azure that is becoming the very basis of business functions and therefore it occupies an imperative position in any business. Cloud technologies are altering the landscape of how companies do business. Microsoft Azure has changed the way of developing and delivering technology solutions. Accordingly, we have designed and devised our cloud services to help businesses and enterprises take the right decision and make the correct choice so as to capitalize on returns from cloud-based ventures. In a way, we have devised techniques that help businesses stay relevant, and manage their work and solutions that exist simultaneously on-ground as well as on the cloud. And in a way, we are defining the path for tomorrow, and laying the very basis for the client enterprise to be completely a digital endeavor of tomorrow. And how Katpro is helping organizations maximize returns via digital and cloud-based approach? As part of our transformational effort, we are employing cloud computing to create seamless groups of businesses, enterprises, developers, and users. By optimizing cloud technology, companies are able to pioneer innovation, realize improved agility, achieve reduced timelines and lesser costs, and see better scalability and flexibility. As a local certified Microsoft Azure Partner, Katpro is helping clients adapt to the digital transformation to build meaningful, actionable disruptive cloud based web services and cloud application development services on Azure cloud platform. And since organizations are still changing over from legacy systems and adapting to cloud-based services, we have found the perfect leeway or that niche, wherein we help update existing legacy systems and solutions via the Cloud IaaS, PaaS and SaaS solutions and thus help synchronize the two. Our in-house consultants offer rich dividends in the form of their experience, exposure, and awareness. And companies can cash in on this by honing solutions, scaling up, and steering opportunities and understanding issues or concerns faced in the cloud. As part of our service repertoire, we help plan the roadmap, assess costs, anticipate and analyze gaps if any, offer advices and constant support, and taking care of the maintenance and upgrades. It is said that for over 57% of the Fortune 500 organizations, Microsoft Azure serves as the pivot. It serves as the strategic discerner enabling customers’ in their quest for continued inventiveness and innovation for so as to develop manage and set up workable solutions. Therefore, as one of the leading cloud technical support companies in Tampa, Florida, our offerings include Microsoft Azure application development, Microsoft Azure migration, and cloud technical support and maintenance and this in turn is enabled by our team of Microsoft Azure Certified Professionals. The Microsoft Azure platform is perfected for platform services (PaaS) and infrastructure services (IaaS) and offer solutions that are a perfect amalgam. Organizations or enterprises are given the ultimate choice starting with conducting task decisive transactions to delivering engrossing, superlative content. Katpro has devised best practices that employs extensible, cloud-based applications and thus aims to deliver unparalleled efficiency or output. And this in a way guides user experience that is stimulated by available data sources and a range of content. We help our clients put together, and deliver applications that in turn shore up their core business functionalities and thus augment efficiency and output. The years of practice and experience are put to best use when we develop cloud-based applications and products for clients’. We adhere to all established standards and compliances and this in a way acts as the guiding force when we count on tools to augment productivity and better the quality of code. Automation is the name of the game. We rely on automated services to build, test, and deliver to the cloud. In a way, assuring continued integration. Performance and scalable quotient testing is carried out so as to ensure that the cloud-based applications are flexible and working in tandem. We help you evaluate your requirements, current IT infrastructure and then formulate a robust and growth oriented cloud strategy to address key business areas and responsibilities. With our services, you can use the full potential of cloud technology to drive sales, and get best-fit platform recommendations from our highly experienced team. We understand the nuances of cloud services at a core level, and can help you with deciding major factors like types of cloud (IaaS, PaaS or Saas), cloud models (public, private or hybrid), hosting options, requirement analysis, architectural guidance and deployments plans. Once you are clear on what type of cloud assessment will work well with your enterprise needs, you can leave it up to us to integrate the same within your systems without any downtime or effect to your existing systems. We also provide maintenance and employee training to ensure maximum extraction of potential. Setting the Benchmark for Enterprise Content and Document Management. Explore the new wave of Data that drives businesses. Discover the freedom enabled by top notch mobility solutions. End to end PAAS and SAAS solutions and development.